When you want great fragrance in your home or commercial workspace, or you want to neutralize bad odors in bathrooms, the automatic Microburst 3000 air freshener dispenser from Rubbermaid Commercial Products is the choice for you. The patented "Days to refill" indicators take the guesswork out of changing microburst 3000 refills. Models with LumeCel technology prevent the need of changing batteries with its rechargeable energy system! 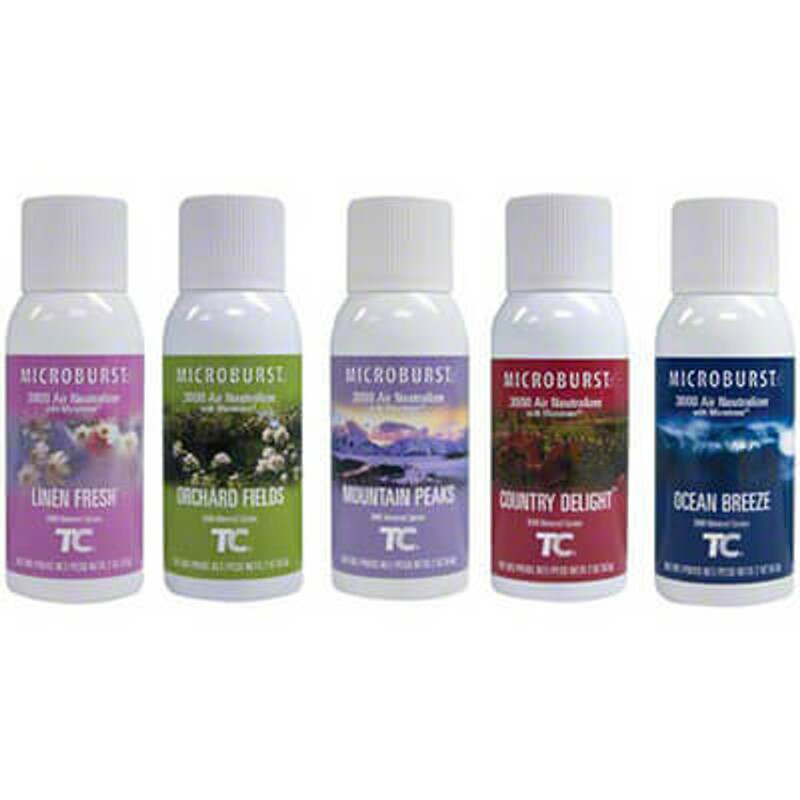 Wide choice of microburst aersol fragrances available. Maybe you have a washroom with bad odors and you need a powerful odor neutralize with a pleasing fragrance. The best solution is using Rubbermaid Microburst 3000 refills. These refills are compact air fresheners that deliver a powerful fragrance with each spray, three times better that ordinary air freshener refills. Rubbermaid Microburst 3000 refills come with flexible options to suit specific requirements of different rooms. This makes them highly reliable. They come in 75ml cans, thereby reducing waste. They are also easy to use, giving you a great experience every time you visit the washroom. Despite their small size, they can offer full strength odor neutralizing ability for up to 24 weeks. However, you can set refill life on the dispenser for 30, 60, or 90 days. Furthermore, their fragrance is not affected by room temperature, humidity and airflow, thereby enhancing their efficiency and longevity. These refills combine designer fragrance and modern technology that disperses molecules further while keeping them airborne for long. This offers a long-lasting antidote to any bad odor, keeping you satisfied whenever you visit the washroom. Microburst 3000 refills emit harmless vapors, making them safe for use while still being eco-friendly. They have a lower carbon footprint than standard refills and boast of having lower energy consumption. The cans have a compact design. They are designed for use in Rubbermaid's Microburst 3000 dispenser. Each refill delivers 3000 sprays and the dispenser comes with visual indicators that show battery life. Despite their small size, Rubbermaid Microburst 3000 refills deliver flexibility, power, and performance. They are actually half the size of standard refills and contain 63% less VOCs per spray when compared to standard aerosols. The cans take extremely minimal space due to their small size. Their refill actuator is patented and distributes fine, dry mist for unmatched performance. More so, these refills combine affordability with great looks and effective performance. The refill cans are available in stainless steel, satin, black, and white finishes. Microburst refills available in different fragrances, ranging from fruit, oriental, floral, citrus, herbal, to oriental. The fruit fragrance is exotic with notes of melon and mango for maximum intensity. The citrus fragrance is combined with fresh notes of mango and peach or blends of lime, grapefruit, orange, and lemon. Ripe fruit notes are combined with undertones of woody musk, rose, and sweet amber to generate inspirations while a balance mixture of fruity notes and woody floral create a clean fragrance. You can also choose a blend of vanilla, grapefruit, and orange for enhanced fragrance. There are many more fragrances to choose from, including custom fragrances. These fragrances are all noticeable and long-lasting. Every washroom user would surely appreciate these fragrances. The fragrances work on your emotional and mental health, eliminating all traces of depression, anxiety, and stress. They elicit positivity, clean air, and calm in any room. With outstanding, long-term odor neutralizing properties, Rubbermaid Microburst 3000 refills are surely the best refills to go for. Their clean, fresh fragrances permeate any room with subtle scents, thereby reassuring users that a room is safe, clean, and comfortable. Furthermore, these refills do not fail or leak, thus, you can rest assured of an uninterrupted experience until the next refill.